The Munich U-Bahn (German: U-Bahn München)[note 2] is an electric rail rapid transit network in Munich, Germany. The system began operation in 1971, and is operated by the municipally owned Münchner Verkehrsgesellschaft (MVG; Munich Transport Company). The network is integrated into the Münchner Verkehrs- und Tarifverbund (MVV; Munich Transport and Tariff Association) and interconnected with the Munich S-Bahn. The U-Bahn currently comprises eight lines, serving 96 stations (100 stations if four interchange stations with separate levels for different lines are counted twice), and encompassing 103.1 kilometres (64.1 mi) of routes. Munich U-Bahn Police after a football game. The network has 103.1 kilometres (64.1 mi) of active route, and 100 stations. [note 1] In 2014, 390 million passengers rode the U-Bahn. The trains operate at speeds up to 80 kilometres per hour (50 mph), which is the top speed among German U-Bahns. There is no continuous operation during the night (break from 1 to 4 am, 2 to 4 am on weekends) except on special occasions such as New Year's Eve. Currently, only the U6 line, crosses the municipal border to the town of Garching. Except for the lines U5 and U6, all lines operate completely below ground. U5 only comes above ground at the south terminus Neuperlach-Süd, U6 on the northern section from Studentenstadt (except Garching and Garching-Forschungszentrum stations and tunnels). There are three "line families", which consist of two lines (not counting peak hour lines) that share a common track in the city centre. The schedules of these lines are coordinated in a way, which yields regular train intervals on the common section. Most stations have two tracks with an island platform between them. Of the single-line stations, only the stations Olympia-Einkaufszentrum (U1), Richard-Strauss-Straße (U4), Neuperlach Süd (U5), Garching-Hochbrück and Nordfriedhof (both U6) have side platforms. At the junction stations Scheidplatz and Innsbrucker Ring, the four tracks lie in parallel on the same level with two island platforms allowing cross-platform interchange. The stations Hauptbahnhof (lower level), where U1 and U2 branch into two different lines and Münchner Freiheit (U3/U6) also have four tracks, while Implerstraße (U3/U6), Max-Weber-Platz (U4/U5) and Kolumbusplatz (U1/U2) have three: one with a side platform for outbound trains and two with a shared island platform for inbound trains. Olympiazentrum, Fröttmaning and Kieferngarten also have four tracks each, due to the proximity of the Olympic Stadium, the Allianz Arena football stadium, and the technical base, respectively. At Hauptbahnhof, there is a second U-Bahn station for lines U4/5 at a higher level, giving a total of six U-Bahn tracks. Sendlinger Tor, Odeonsplatz and Olympia-Einkaufszentrum also each have two stations at different levels being totally distinct stations on their own, connected with each other by escalators and elevators. Most lines operate with trains running at intervals of every 5 minutes during peak hours, but due to lines overlapping, a suitable train for a journey can be as frequent as every 2 minutes. Outside of peak times lines operate trains at frequencies of every 10 minutes; however, around the start of operations and after midnight the line frequency decreases to every 20 minutes or more on most lines. Again with line overlap this means that a suitable train will arrive (often much) more frequently. In 1980 the U1 commenced operation together with the U8 (now U2). At the beginning it was only operating on a section of U2's track. When the branch to Rotkreuzplatz was opened, it became a separate line. The line's colour is green. Today the U1 has a length of 12.2 kilometres (7.6 mi) and 15 stations. It starts at Olympia-Einkaufszentrum in the district of Moosach. The U3 was extended to the same station (but on a different level) in 2007. On the way south it follows Hanauer Straße to Georg-Brauchle-Ring, which has been designed by Franz Ackermann, reaching Westfriedhof. It continues via Gern to Rotkreuzplatz, which was its terminus from 1983 to 1998. Below Nymphenburger Straße it goes on to Maillingerstraße and Stiglmaierplatz and finally merges into the U2 track at München Hauptbahnhof. On the busy city section, U1 and U2 run with a 5-minute offset, yielding 5 minute intervals even beyond peak hours. At Central Station, it also crosses the S-Bahn and U4/U5. At the next station, Sendlinger Tor, it passes below U3/U6. There the U1/U2 platforms for each direction lie in tunnels which are apart from each other and are connected by a pedestrian tunnel. Fraunhoferstraße, the next station, is also reached in separate tunnels, which had to be excavated using tunneling shields due to the proximity of the River Isar. However, the two tubes are connected by the platform, which demanded large pillars that are characteristic for this station. The next station, Kolumbusplatz, is a junction which has three tracks. Here the U1 branches off the U2 again. The southbound branch line was opened in 1997 and traverses the colourful station Candidplatz, eventually reaching Wettersteinplatz. The following station, St.-Quirin-Platz has an extraordinary architecture, as it is covered by a large, shell-like structure made from glass and steel, which is drawn nearly down to track level on one side. The U1 terminates at Mangfallplatz below Naupliastraße. The route of the U2 line has undergone more changes than any of the other Munich underground lines. It also changed its name as it was first called U8. It is the only line that runs or ran on all three "line families" (U1/U2, U3/U6 and U4/U5). Today it has a length of 24.4 kilometres (15.2 mi) and 27 stations. The line's colour is red. The U2 starts in the north at Feldmoching, where it connects to the S1 to Freising/Airport. The station there is decorated with rural and urban motives of Feldmoching's history. Below Hasenbergl, a district which had been known for its social problems, it goes to Dülferstraße, which provides access to the eastern Hasenbergl and a newly built area on Panzerwiese. Dülferstraße was the terminus from 1993 till 1996. Via the stations Harthof and Am Hart, the U2 reaches Frankfurter Ring. In the tunnel between Am Hart and Frankfurter Ring, there is a white and blue wave pattern, which is the only installation of art in a Munich U-Bahn tunnel outside of stations. After Milbertshofen station the U2 touches the U3 line at Scheidplatz, where cross-platform interchange is possible. Before the opening of the section to Dülferstraße in 1993, U2 went from Scheidplatz to Olympiazentrum, sharing the track with the U3. Through the district of Maxvorstadt the U2 continues to downtown Munich, reaching the stations Hohenzollernplatz, Josephsplatz, Theresienstraße und Königsplatz. At Königsplatz one can find artworks from the nearby Glyptothek on the platform. At München Hauptbahnhof (Munich Central Station), the U2 meets the U1, with which it shares tracks until Kolumbusplatz (see above). After Kolumbusplatz the U2 continues eastward and reaches the stations Silberhornstraße, Untersbergstraße and Giesing (Bahnhof), with an interchange possibility to S7 and S3. The next stations are Karl-Preis-Platz and Innsbrucker Ring, where cross-platform interchange to the U5 is possible. Until 1999, when the branch to the Messestadt stations was opened, the U2 ran from here to Neuperlach. Via the stations Josephsburg and Kreillerstraße the U2 reaches Trudering, which features two platforms in separate tunnels, connected by two transversal tunnels. In 1994, during the construction of this section, an accident happened: the ceiling of the new tunnel collapsed due to the intrusion of water and a bus fell into the crater. Two passengers and one construction worker died and the construction was delayed. Via Moosfeld, the U2 reaches Messestadt-West and its terminus Messestadt-Ost. These stations are located between the fairgrounds (Messestadt) in the north and a development area and the Bundesgartenschau 2005 in the south. The U3 is the original Olympic line; the first section was opened for the Olympic Summer Games 1972. Today the line has a total of length of 21.2 kilometres (13.2 mi) and 25 stations. The line's colour is orange. Today the U3 starts in the north at Moosach, Munich's 100th U-Bahn station, where you can change to the S1 to Freising/Airport. From here the line runs east to Moosacher St.-Martins-Platz and Olympia-Einkaufszentrum, where a change to the U1 is possible. After passing through Oberwiesenfeld station, the U3 reaches its original northern terminus at Olympiazentrum. From 1972 until 2010, this station was the end of the original Olympic line. When Munich was awarded the Olympic Summer Games 1972 in 1965, the U-Bahn network concept (which was adopted only one year earlier) had to be revised to speed up the construction of a connection to the Olympic venues at Olympic grounds. The Olympic connector (now U3) was redesigned as a branch of the U6 line, because the original plan of a direct connection to the Olympic ground from Munich Central Station was not feasible in the shortness of time. This original U3 sections consists of four stations (from north to south): Olympiazentrum, Petuelring, Scheidplatz, where cross-platform interchange to the U2 (the line originally supposed to serve the Olympic venues) is possible since 1980, and Bonner Platz. After Bonner Platz the U3 reaches Münchner Freiheit, where it joins the U6 to run together through the inner city section to Implerstraße (for this section see U6 below). After leaving the three-track junction station Implerstraße, the U3 reaches Brudermühlstraße, Thalkirchen (Zoo) and Obersendling, which is built 30 metres (98 ft) higher than the Thalkirchen station, because it is located on the "Hochufer" (western tread) of the River Isar. Here, interchange to the S-Bahn at Siemenswerke station is possible. The U3 continues west via Aidenbachstraße and Machtlfinger Straße, before reaching Forstenrieder Allee, Basler Straße, and eventually the terminus Fürstenried West. This southern-eastern section was opened on October 28, 1989, as can be seen from huge date numbers on the western entrance of Obersendling station. With only 9.2 kilometres (5.7 mi) and 13 stations, the U4 is Munich's shortest U-Bahn line. This line has originally been planned as U9 and is the only line that operates regularly with 2-train sets rather than the full 3-train set. The exceptions are Fridays in the late afternoon and during the Oktoberfest. The line's colour is mint green. The U4 begins in the west in the Laim neighbourhood at Westendstraße station, which it shares with the U5 line. Both U4 and U5 are the only lines of a joint line "family", which only branch out on one end of the common line, as an originally planned western extension of the U4 was first put on hold and was subsequently cancelled altogether. From Westendstraße the U4 runs east to Heimeranplatz, which connects to S7 and S20 S-Bahn lines. The next two station, Schwanthalerhöhe (originally called Messegelände, the German for "exhibition grounds"; the name was changed when the exhibition centre relocated to Riem in 1998) and Theresienwiese, are gateways to the Oktoberfest, and are therefore highly loaded during this event. Between both aforementioned stations, there is a track that links to Implerstraße to provide a connection to the depot in Fröttmaning. Theresienwiese is one of only two U-Bahn station in Munich (besides Fröttmaning station which serves Allianz Arena) to have the command centre booth that is opened during the Oktoberfest for supervising the masses of passengers. The south exit of the station leads to the northern entrance of Oktoberfest. U4 trains arriving from the east often terminate at Theresienwiese rather than continue to Westendstraße even during peak hours due to low traffic volume east of Hauptbahnhof. After Theresienwiese the U4 reaches München Hauptbahnhof (Munich Central Station); passengers can transfer to U1/U2 lines as well as to all S-Bahn lines (except S20) here. The next station is Karlsplatz (Stachus) with shorter and easier connections to S-Bahn (S1 to S8). Karlsplatz is the deepest station in Munich's U-Bahn network (36 metres (118 ft) below the surface). From this point on, the U4 runs north of the S-Bahn cross-city tunnel. After passing Odeonsplatz, where an interchange to U3/U6 trains is possible, and Lehel, the U4 crosses the River Isar in a tunnel, and reaches Max-Weber-Platz, the last station that is shared with the U5. Here, the U4 branches off to the north, while the U5 runs south. Before terminating at Arabellapark, the U4 passes the stations Prinzregentenplatz, Böhmerwaldplatz, and Richard-Strauss-Straße, the latter being the only station of the line to be equipped with side platforms instead of an island platform. The original plan called for an extension to Johanneskirchen station (where easy transfer to the S8 S-Bahn line would be possible) via Fideliopark, but was never built, due to low current ridership in the area north of Max-Weber-Platz. The extension of the tram line in the area in 2011 made the plan even more unlikely to materialise. A possible extension in the west to Blumenau is even more improbable. In the evenings from around 20.40 to the close of operations, the U4 only operates between Odeonsplatz and Arabellapark. The U5 currently begins at Laimer Platz; an extension to Pasing is planned. The total length currently is 15.4 kilometres (9.6 mi). The line's signature colour is brown. Via Friedenheimer Straße, the U5 reaches Westendstraße. From there, the U5 shares the tracks with the U4 to Max-Weber-Platz (see above). At Max-Weber-Platz, the U5 branches off to the south to East Station (Ostbahnhof), where changing to all S-Bahn lines is possible. The next station, Innsbrucker Ring, allows cross-platform interchange to the U2. The U5 continues south to Michaelibad, Quiddestraße, and Neuperlach Zentrum, which is the centre of the satellite town of Neuperlach, built during the 1960s and 1970s. Going on to Therese-Giehse-Allee, the U5 comes above ground and reaches its terminus Neuperlach Süd, where it allows cross-platform interchange with S-Bahn line S7. South-east of Neuperlach-Süd is a large parking yard (Betriebsanlage Süd) used to park trains which can't be parked at the technical base in Fröttmaning or within the network. The U6 is the oldest U-Bahn line of the network and also features the oldest tunnel built: the section below the Lindwurmstraße (between Sendlinger Tor and including the station Goetheplatz) was already built 1938-1941 as part of a planned S-Bahn network. For this reason Goetheplatz has a platform longer than the standard 120 metres (390 ft). Today the line has a length of 27.4 kilometres (17.0 mi). Its signature colour is blue. The distance of 4.1 kilometres (2.5 mi) to the next station at Fröttmaning is the longest distance between two stations in Munich's U-Bahn network. Fröttmaning has been expanded to two island platforms and four tracks to cater for the Allianz Arena football stadium, built for the 2006 FIFA World Cup. The technical base of the U-Bahn is located at Fröttmaning, too. After passing Kieferngarten station, which has two island platforms as well, it crosses over a rail bridge to Freimann and Studentenstadt. Between these two stations is a connection to mainline railway tracks, which is used to bring new trains into the network. The bridge was originally used by the tram and was the only tram track to be converted to be part of the U-Bahn network. The U6 then continues underground for the rest of its way south. Via Alte Heide, Nordfriedhof (station with side platforms), and Dietlindenstraße, the U6 reaches Münchner Freiheit, where it joins the U3 on the shared inner city tunnel. Passing Giselastraße and Universität (University), it arrives at Odeonsplatz, where it connects to the U4/U5 lines. Continuing to Marienplatz, it crosses the S-Bahn lines. During peak hours this station is can get overcrowded, which is why additional pedestrian tunnels were built between 2003 and 2006. At Sendlinger Tor the U3/U6 crosses the U1/U2 line, and interchange is possible. The line now uses the tunnel built in 1941 mentioned above as far as Goetheplatz. The next station, Poccistraße was added belatedly, constructed between the two existing tunnels which stayed operational. At Implerstraße the U3 and U6 separate again. To the north of the station, facing north, there is a branch to the U4/U5 at Schwanthalerhöhe, which is not used for passenger transport. At Harras the U6 connects to the S-Bahn lines S7 and S27, and to regional trains to the south. The section via Partnachplatz and Westpark to Holzapfelkreuth was constructed for the Internationalen Gartenbauausstellung (IGA) in 1983 was therefore dubbled "flower line", which is reflected in the design of these stations. Passing Haderner Stern and Großhadern, the U6 reaches its current southern terminus at Klinikum Großhadern, where the entrance to the station is covered by a glass pyramid. An extension to Martinsried, which is only approx. 1 kilometre (0.62 mi) west of the current terminus, is planned and agreed upon, and is supposed to open in 2019. This new booster line was added in December 2011 along with the new tram extension to St. Emmeram. The U7 runs between Westfriedhof and Neuperlach Zentrum via München Hauptbahnhof and Innsbrucker Ring: it shares the tracks with the U1 from Westfriedhof to Kolumbusplatz, the U2 from München Hauptbahnhof to Innsbrucker Ring, and the U5 from Innsbrucker Ring to its southern terminus Neuperlach Zentrum. The stations along U7 line are Westfriedhof, Gern, Rotkreuzplatz, Maillingerstraße, Stiglmaierplatz, München Hauptbahnhof, Sendlinger Tor, Fraunhoferstraße, Kolumbusplatz, Silberhornstraße, Untersbergstraße, Giesing Bahnhof, Karl-Preis-Platz, Innsbrucker Ring, Michaelibad, Quiddestraße, and Neuperlach Zentrum. This booster line started operations in December 2013. The U8 begins in the north at Olympiazentrum and shares the tracks with the U3 as far as Scheidplatz, where it continues along the U2 tracks to München Hauptbahnhof and terminates at Sendlinger Tor. It is only running on Saturdays to ease crowding on the U2 and U3 lines, and to provide people an easier access to the Olympic Park from Munich Central Station. The stations along U8 line are Olympiazentrum, Petuelring, Scheidplatz, Hohenzollernplatz, Josephsplatz, Theresienstraße, Königsplatz, München Hauptbahnhof, and Sendlinger Tor. Munich U-Bahn uses three different generations of electric multiple unit trains. The stock of over 550 carriages is shared between all lines. Class A trains were built between 1967 (prototypes) and 1983. The units consist of two carriages, which always remain coupled in normal operation. The double-carriage units have a length of 37.15 metres (121.9 ft), a height of 3.55 metres (11.6 ft), and a width of 2.90 metres (9.5 ft). Each unit has six doors per side and a capacity of 98 seats and standing room for 192 passengers. A total of 193 double-carriage units were delivered, of which 179 are still in use in Munich. Up to three A double-carriage units can be coupled together to form a 3/3 train (Langzug). Class B trains were built between 1981 and 1994 to provide more stock to service the growing network in the 1980s. As with the class A trains, six prototypes were ordered. However, it took six years until the series production started and the prototypes had to be modified to match the series-production units. B units have the same size as A units but differ in the design (especially of the front window) and use three-phase current instead of direct current motors. The other difference is the door opening mechanism. On B units, the passengers only need to pull just one handle to open both doors rather than both handles as on A units. Of a total of 63 units, 57 are still in service (including one prototype), and six have been scrapped. As with A trains, up to three B double-carriage units can form a 3/3 train (Langzug). However, it is not possible to form a mixed train of A and B units, which are not compatible. Class C units were designed in the late 1990s to replace the A units, the operation of which is hardly economically reasonable after 30 years. C units consist of six carriages allowing passage through the whole train. Only the first and last unit of each train have driver's cabs. C units can only operate as six-unit trains which have the same length as 3/3 trains. Ten trains were ordered without prototype units being previously tested, and these were finally put into service in 2002 after long delays due to technical difficulties. Eight more units were delivered in the run-up to the 2006 FIFA World Cup. A further 21 six-car Class C vehicles, designated as C2, were ordered from Siemens Mobility in November 2010. The C2 vehicles can ferry 940 passengers (as opposed to 912 by C1), have brighter lighting, monitors for passenger information, upholstered seats and coloured LEDs on the doors which signal opening and closing of the doors. As of May 2015, none of the C2 carriages had entered either limited or regular service. C2 had not obtained the operating certification due to technical defects, which have largely been addressed. In addition, numerous changes in federal and state law had caused some confusions and problems with preparing the necessary documentations for the certification process. In June 2016, one Class C2 vehicle was permitted to operate on the northern part of U6 line between Kieferngarten and Garching Forschungzentrum as a trial run for the Technical Supervisory Authority (Technischen Aufsichtsbehörde i.e. TAB) of the Oberbayern government to make their assessment. On 15.11.2016, a further 4 vehicles have been added to the Class C2 fleet and they are now operating on the entire U6 line from Garching Forschungzentrum to Klinikum Grosshadern. Upon approval from TAB, 16 more Class C2 vehicles, which are currently at Siemens, can join the Munich subway fleet. During the Olympic Summer Games 1972 and the visit of Pope John Paul II in 1980, rolling stock from Nuremberg, which was then compatible with Munich's stock, was used in Munich. All stock has a maximum speed of 80 kilometres per hour (50 mph) and can be operated by Linienzugbeeinflussung (LZB), which allows short train intervals at distances as small as 80 metres (260 ft). As the control couplings are asymmetric, only units facing in the same direction can be (electrically) coupled. As there is no way to turn units in the network, they are tied to the direction, which is why every train unit as well as every station has a "north" and a "south" end. Fortunately, there have been no serious accidents during service on the Munich U-Bahn. To date only three double-carriage units had to be scrapped due to accidents, all of which happened in the depot. The only fatal accident in connection to the U-Bahn happened on 20 September 1994, when the ceiling of a tunnel under construction collapsed near today's Trudering station, dragging a public bus into the ensuing hole in Truderinger Straße. Two passengers were killed, as well as the construction worker who tried to warn the bus driver. Already in 1905 there were plans to build an underground metro in about the route of today's trunk line of the S-Bahn between the main and Ostbahnhof and a ring road that surrounds the old town. Since these plans for the then traffic were clearly oversized, they came back into oblivion. The tram network was able to cover the traffic flows in the former half-million city. From 1910, the only 450 m long, automated Munich subway metro connected the main station with the post office on Hopfenstraße. It served only for the transport of letter post. In 1928 there were again plans to replace the trams in Munich by a subway network, but any such plans for this were thwarted the global economic crisis. A network of five subway routes, which had some similarities with today's route distribution, was to be realized. At the time of National Socialism, from 1936, a network of electric subterranean railways was planned for the "capital of the movement" and construction was begun, but the Second World War put an end to this. The tunnel of today's U6 between Sendlinger Tor and Goetheplatz - including the station there - were already completed in the shell, but still as part of a rapid-transit railway route. This also explains the relative generosity of Goetheplatz (especially in the blockade entrance Goetheplatz does not fit the architecture today) and the narrowness of the present interchange station Sendlinger Tor on the platform U3 / U6. In the Lindwurmstraße took place on 22 May 1938, the groundbreaking ceremony for this tunnel, which should herald the beginning of the end of the tram. By 1941, the shell was completed, first railcars were to be delivered in the same year. The war-related scarcity of resources led to the cessation of this work. The shell was used during the war as an air-raid shelter, of which today still bears inscriptions on the tunnel walls. Parts of the tunnel were filled with debris after the war, others served for a while as a breeding ground for mushrooms, before penetrating groundwater made the short piece of early metro history unusable. The Nazis forbade the acquisition of new rolling stock for the Munich tramways in order to show how "insufficient" the tram system was. At that time, trams were the primary means of public transportation in Munich. The Nazis made ambitious plans to change Munich into their "Reichshauptstadt der Bewegung" (Capital of the movement; the Nazi party had come to existence in Munich). This included the construction of an underground system. In the late 1930s, construction started in Lindwurmstraße and Sonnenstraße, where Munich's main Lutheran-Protestant church, Matthäuskirche, was torn down because it was supposedly a "traffic obstacle" (so was the Munich's main synagogue not far away as well as the tower of the Old Town Hall). Construction was abandoned in 1941 as World War II intensified. After the war, the priority was to reconstruct the badly-damaged tram system. However, even during the 1950s the Munich City Council discussed plans to run a few of the tram lines underground because the capacity for surface traffic was overstretched. It planned four diameter lines (designation A, B, C, D), which divided the city into eight sectors and contained essential elements of today's network of lines. An east-west line "A": Pasing - Laim - Westend - Stachus (change in line "B") - Marienplatz (change in line "C") - Ostbahnhof - Berg-am-Laim. Another line "B": Moosach - Gern - Rotkreuzplatz - Stiglmaierplatz - Stachus (change in line "A") - Odeonsplatz - Max Weber Square - Bogenhausen - Zamdorf - Riem. A north-south line "C" was along Freimann - Münchner-Freiheit - Marienplatz (change in line "A") - Goetheplatz (already built 1938-1941 interchange station to the line "D") - Harras - Waldfriedhof planned. A north-south line "D" with the lines: Settlement am Hart - Scheidplatz - Elisabethplatz - Central Station - Goetheplatz (change to line "C") - Giesing. Calls for a ring line of the subway were soon rejected, as this was the tangential passenger volume was too low, but you took in the construction of the S-Bahn trunk line at Rosenheimer Platz station consideration that should not be built the possibility of a crossing station here. Today, the tram takes on the most tangential traffic flows, the concept of a ring metro has been adopted. Work started on 1 February 1965 at Nordfriedhof (North Cemetery) in Ungererstraße (now known as Schenkendorfstraße). Today a steel girder at the first building site is a monument to Munich's first underground railway. When the 1972 Summer Olympics were awarded to Munich in 1966, construction had to be sped up to get the "Olympic" line finished on time. On 19 October 1971 the first line commenced operations between Kieferngarten and Goetheplatz with a total length of 12 kilometres (7.5 mi). On 8 May 1972 the line between Münchner Freiheit and Olympiazentrum ("Olympic line") to the venues of the Olympic Summer Games 1972 was opened, just 10 days after the Munich S-Bahn commenced operations. To satisfy demand during the Games, some DT1 trains were borrowed from Nuremberg. On 22 November 1975 the extension from Goetheplatz to Harras was opened. The network has been expanded continuously since 1980. The activities of the U3 and U1 should be extended on a case-by-case. The beginning of the extension of U1, from Westfriedhof to Georg-Brauchle-Ring, opened in 18 October 2003, whereas another station, Olympia-Einkaufszentrum was later opened in 31 October 2004. Similarly, on 28 October 2007, the new era had resulted in U3, extending from Olympiazentrum, via Oberwiesenfield, to the Olympia-Einkaufszentrum, and later on it was extended to Moosach on 11 December 2010. This is a similar concept to the fictional U3 extension, which was achieved in 2007 and 2010 respectively. The new Allianz Arena (football stadium) required a larger capacity of the nearby U-Bahn station at Fröttmaning. A new second platform was built and the whole station was moved north by roughly 100 metres (330 ft). For easy access to the platform, a second pedestrian bridge was built at the north end of the platforms. At the same year, U6 was extended on 14 October 2006 from Garching-Hochbrück to Garching-Forschungszentrum via Garching. This is a similar concept to the fictional U1 extension, where it had needed a new series of trains. The new Allianz Arena (football stadium) required a larger capacity of the nearby U-Bahn station. A new second platform was built and the whole station was moved north by roughly 100 metres (330 ft). For easy access to the platform, a second pedestrian bridge was built at the north end of the platforms. The increase in traffic and the new Allianz Arena also required a larger capacity of this already overcrowded pivotal transfer station. New pedestrian tunnels were built, which provide more room for passengers transferring from and to the S-Bahn. They lie parallel to the existing platforms and are connected to them by 11 portals. At the south end, they meet the transverse tunnel, where the escalators to the S-Bahn platforms are located. Due to the poor design consideration of passenger movement, Sendlinger Tor station has severe congestions when transferring between U1/U2/U7/U8 and U3/U6 lines. Additionally, the each of U1/U2/U7/U8 platforms has only one passage in the middle for accessing U3/U6 platform and mezzaine level, causing the severe chokepoint. The passengers using lifts must transfer from one to other on mezzaine level if they wish to go to the street level or U1/U2/U7/U8 platforms. The landing of escalators between U1/U2/U7/U8 and U3/U6 lines are placed too close to the U1/U2/U7/U8 platforms. Each of U1/U2/U7/U8 platform will have new dedicated passage to the street level at the southern end (Blumenstraße-Verbindungstunnel) without going through mezzaine level along with new access to the mezzaine level at the northern end (Sonnenstraße Verbindungstunnel). That includes the new direct access lifts, escalators, and staircases. The current staircases and escalators between U1/U2/U7/U8 platforms and mezzaine level will remain. The escalators and staircases between U1/U2/U7/U8 and U3/U6 platforms will be rearranged as to improve the flow. The mezzaine is being renovated with some sections rebuilt as to eliminate the small stairs and narrow ramp, which interrupt the flow. The interior would have blue and yellow colour, giving the station bright and airy feel. The renovation and upgrade are scheduled to be completed in 2022. Although the plans for this extension were quite advanced, low passenger forecasts have led to its abandonment in favour of a tram or light rail from Schwanseestraße. But in 2015 and 2016, it was also announced that it will be extended to Solln. With this extension, the U1 would end at an S-Bahn station and the Olympia-Einkaufszentrum would become the Northern Cross envisioned by the U-Bahn Office. This will also connect to the S-Bahn and the U-Bahn line U2 at Feldmoching, and it will directly terminate at Hasenbergl Nord, which will be 3 km north of the current Hasenbergl. In addition, there are also plans to extend the line to Feldmoching. This was abandoned. The city council of Bündnis 90 / Die Grünen and the CSU faction in the town council of Karlsfeld proposed the above-ground extension of the U2 from Feldmoching to Karlsfeld as a measure to relieve the municipality of the heavy car traffic. Moreover, this should provide a greater incentive for the employees of the large companies MAN and MTU to use public transport for their work. After initial investigations had shown a low cost-benefit ratio for this route, it was not cost-effective and was abandoned. This extension is planned after the U3 has been extended to Moosach, and it will go via Waldhornstraße. This extension is considered in the third medium-term planning (Mittelfristprogramm) along with the plan of moving a portion of S8 line from surface to underground between Unterföhring and Leuchtenbergring stations. Whether the extension would be approved and when will it be built is not clear. The stations do include Cosimapark, Fideliopark, and Englschalking, all of which are in Bogenhausen. The 3.7-kilometre extension has been approved on 14 July 2015 with construction to commence in 2019. The date of completion is still not set. The cost is about 547 million euros. The route will have two stations, Willibaldplatz and Am Knie, before terminating at Pasing train station. The Willibaldplatz station is to have three platforms with third track set aside for the possible future extension into the western and southwestern area. The extension will terminate west of Pasing train station to make room for the emergency evacuation and storage: this can, too, be readily extended further west to the city boundary if the demand calls for it. On 17 July 2015, there are citizen initiative and petition drive supported by Christian Social Union (CSU) and Social Democratic Party (SPD) to extend U5 route to Freiham. The reason for involvement of political parties and citizen initiative is the rejection by MVG of this further extension due to cost factor and due to existence of two S-Bahn stations in Freiham. This extension will give access to the biotech centre at Martinsried. As the tracks will cross the municipality boundary of Munich, planning and financing is the responsibility of the municipality of Planegg or the Free State of Bavaria. The further extension of the U6 to Martinsried was approved by the district council in July 2009. The 67 million euro and approximately 1,300-metre (4,270 ft) long line was to have started operation in 2014/2015. However, complications meant that the Bavarian state cabinet did not approve the project until December 2014. Construction is now to begin at the end of 2016 and conclude by 2020. This would be only U-Bahn line with direct access to the Munich_Airport. At Hallbergmoos station, U6 would continue in parallel with S8 line to the airport and stop at both terminals before travelling further to Eching and Neufahrn. However, the plan was abandoned. On 11 February 2014, SWM/MVG announced a detailed report for the construction of new 10.5-km bypass line, a sixth intracity underground line, to be called the U9. The new line will relieve the overburdened U1/U2/U7/U8 and U3/U6 lines, especially the transfer stations at Sendlinger Tor (U1/U2/U7/U8 and U3/U6), Hauptbahnhof (U1/U2/U7/U8, U4/U5, and S-Bahn), and Odeonsplatz (U3/U6 and U4/U5), and will shorten the travel time between the Hauptbahnhof and the Allianz Arena by removing the need to transfer at Marienplatz or Odeonsplatz. MVG is predicting tremendous growth of passenger traffic in the northern section of Munich in the next twenty years and wanted to plan accordingly. The U9 line is projected to carry ten million passengers per year and to cost between 250 and 360 million euros, with an estimated completion date of 2030-2040 if funding were approved. The proposal has been revised and approved in January 2018 as to integrating the three major construction projects at Hauptbahnhof: second S-Bahn tunnel and station, new dedicated U9 platform, and reconstruction of Hauptbahnhof. The revised plan eliminates U6 service between Implerstraße and Münchner Freiheit as to relieve the overburdened U3 and reduce the heavy congestion at Sendlinger Tor and Odeonplatz when transferring between lines during the rush hour. The U9 takes over the current U6's southwestern (Klinikum Großhadern - Implerstraße) and northeastern (Münchner Freiheit – Garching-Forschungszentrum) extensions. The new stations would be Martinsried (new extension west of Klinikum Großhadern), Esprenatoplatz, Hauptbahnhof (dedicated platform), Pinakotheken, and Elisabethplatz. At Münchner Freiheit, the U9 is connected to the current U6 tracks for continuing to its northeastern terminus at Garching-Forschungszentrum. A further plan of adding a second spur to connect with U2 line at Theresienstraße is planned. The second spur would be called U29: Klinikum-Großhadern – Hauptbahnhof – Theresienstraße – Harthof. This plan would extend the current U6 southwestern terminus from Klinikum-Großhadern to Martinsried. Theresienwiese park has currently one subway station onsite in the north but is served by two additional subway stations a few blocks away (U3/U6 - Goetheplatz in the southeast and U4/U5 – Schwanthälerhöhe in the west). Adding a second onsite subway station in the southeastern area would reduce the heavy Oktoberfest crowd at Theresienwiese station, especially during the closing time. Both stations would have direct connection to Hauptbahnhof without transferring. The museum quarter, Pinakothekenviertel, has one station, U2 – Königplatz, but inconveniently located in the southwestern quarter, requiring long walk to several Pinakotheken museums. The new station, Pinakotheken, would be centrally located in the museum quarter and serve the museums and Technische Universität München within short walking distance. Pinakotheken would be served by tram lines, Tram 27 and 28. The plan calls for closure of current Poccistraße and Implerstraße subway stations and construction of a new four-track "superstation" underneath the Südring, serving U3 and U9, and connect to the new Südring aboveground station serving the regional trains and possibly S-Bahn if the future S-Bahn-Ring is approved. The new station would be called Impler-/Poccistraße as to differentiate itself from the current U3/U6 – Implerstraße and Poccistraße stations. The current Poccistraße station has serious structural problems requiring expensive maintenance and extensive monitoring: it's cheaper to build a new station nearby than continue using Poccistraße. At Hauptbahnhof, the new dedicated U9 platform would be built underneath the current S-Bahn platform but above U4/U5 platform. The platform would be located underneath the regional and long distance train tracks between Holzkirchner Bahnhof (Holzkirchner wing station, serving southwestern Bavaria) and Starnberger Bahnhof (Starnberg wing station, serving southeastern Bavaria) with new mezzaine level connecting U9 platform with both wing stations and the rest of Hauptbahnhof. The advantage of locating the U9 platform in western section of Hauptbahnhof is quick transfer between platforms without long circuitous walk from one platform to other via grand platform in the east. There are serious engineering and design challenges in building a fifth line under the Hauptbahnhof if quick transfers between the two S-Bahn lines (current and future under construction), three U-Bahn lines, and regional and long distance trains are to be achieved. Another proposal for crosstown travel in the north between U2 - Am Hart and U6 (or U9 if opened) - Kieferngarten is under consideration. This U26 would serve the people who live in the north and don't need to travel south in order to travel between northwest and northeast regions. The high cost and fewer stops as compared to tram line would make this proposal less feasible. Different booster lines have been discussed for years without any concrete plans. A third booster line, U10, would share U2 line between Harthof and Scheidplatz then switch to U3 line between Scheidplatz and Implerstraße before turning to U6 line at Harras. The northern and southern terminuses have not been determined yet. A fourth booster line, U11, would share U1 from Olympia-Einkaufszentrum to Kolumbusplatz before switching to U2 line for the continued journey to Innsbrucker Ring station. Which terminus station, Messestadt Ost in the east or Neuperlach in the south, has not been determined. A fifth booster line, U12, would share with U2 between Harthof and Theresienstraße then switch to U9 south of Theresienstraße where it shares with U9 toward Harras. ^ a b There are 100 stations, according to the official source, which counts connecting/transfer stations twice; thus there are 96 stations counting all stations once. 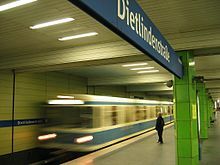 ^ "U-Bahn" is the German contraction for Untergrundbahn or "underground railway". ^ "Railway Gazette: München U-Bahn orders more trains". Retrieved 2010-11-19. ^ Völklein, Marco (17 June 2016). "München hat einen neuen U-Bahnzug - zumindest vorübergehend" – via Sueddeutsche.de. ^ Völklein, Marco (17 October 2018). "Warten auf den neuen Zug" – via Sueddeutsche.de. ^ muenchen.de. "Neue U-Bahnen für die Linie U6". muenchen.de. ^ "U-Bahnhof Sendlinger Tor: Regierung Oberbayern genehmigt Projekt". muenchen.de. January 2016. ^ "U-Bahn nach Freiham! - Online-Petition". openPetition. ^ "CSU will für U-Bahn nach Freiham kämpfen". merkur.de. 17 July 2015. ^ "Projekt U9-Spange" [U9 Link Project] (PDF). MVG Informationen für die Medien. Stadtwerke München. 2014-02-11. Archived from the original (PDF) on 2014-03-09. Retrieved 2015-01-02. ^ "Stadtrat gibt Startschuss für Planungen zur U9". muenchen.de. 17 January 2018. ^ Sascha Karowski (18 January 2018). "U-Bahn-Zukunft: Neue Bahnhöfe, zusätzliche Verbindungsstrecke, U6 entfällt". Merkur tz. ^ Florian Zick (17 January 2018). "Haltestelle Poccistraße wird zum Geisterbahnhof". Abendzeitung München. ^ Christoph Koopmann. (12 October 2016). "Freie Wähler fordern S-Bahn-Ring". Süddeutsche Zeitung. ^ "U-Bahn Linie 26: Kommt sie doch?". Abendzeitung München. 8 October 2014. This page was last edited on 13 March 2019, at 08:09 (UTC).